Our easy Shrimp Scampi recipe takes only a few minutes to prepare and is our favorite of all shrimp pasta recipes. In addition to being easy and fast to prepare, this delicious seafood recipe gets rave reviews from everyone, and for good reason - made from sweet shrimp, garlic, butter, olive oil, white wine, and a little lemon, there's a lot to love! You can make our Shrimp Scampi recipe with fresh or frozen shrimp. When we buy fresh shrimp, we usually go for the fresh jumbo shrimp - or, if that's too pricey, we buy what the markets here call "near jumbo." Large also works well - just takes longer to shell and clean. If you decide to buy frozen shrimp, look for packages with 30 or fewer shrimp per pound. The trick to making perfect shrimp scampi is to have all ingredients plus the pasta ready before you start cooking. Because our version of this favorite shrimp pasta recipe is so fast and easy to make, you'll be finished cooking within 5 minutes or less. 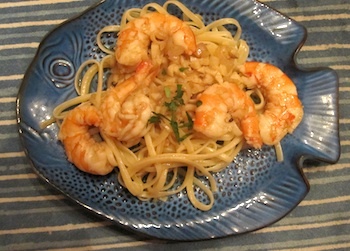 Our photo shows the shrimp scampi served with linguine, but angel hair and capellini work just as well. The thin strands give the sauce plenty of surface area to cling to. Serves 4 as main course, or 8 as a first course. Cook and drain pasta. Divide into 4 plates or shallow bowls. Heat butter, olive oil, shallots (or scallions), and optional red pepper flakes in a skillet over medium heat for about 2 minutes until the shallots begin to soften, but don't turn brown. Add garlic and wine, and cook for 30 seconds more. 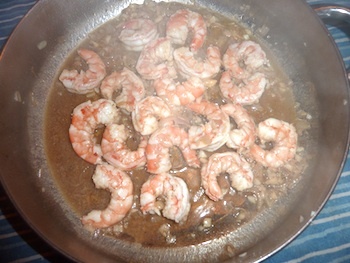 Add shrimp and cook until they turn pink and firm - about 1 to 2 minutes on each side. Remove from heat. Add 1 tablespoon of lemon juice, and taste. Add more lemon juice if needed, as well as salt and pepper to taste. Serve the shrimp and sauce over the pasta, and garnish with the parsley. When serving shrimp scampi as a main course, we like to add a steamed green veggie such as asparagus, peas, or broccoli, plus Italian or French bread for dipping into the wonderful sauce.